Northport NY – Media and radio have taken quite a shine to Sonny & Brownie’s Last Train by the Ambassador of the Blues, Guy Davis and international harmonica sensation Fabrizio Poggi. The homage to Sonny Terry and Brownie McGee, released on March 24, is becoming one of the most celebrated acoustic releases of 2017. Sonny & Brownie’s Last Train is currently no. 1 for the second week in a row on The Roots Music Reports Top 50 Acoustic Blues Albums. Click the logo to see the entire chart. For the past week, stations that broadcast the syndicated radio program Music City Roots have been playing a performance that Guy & Fabrizio recorded in late March. 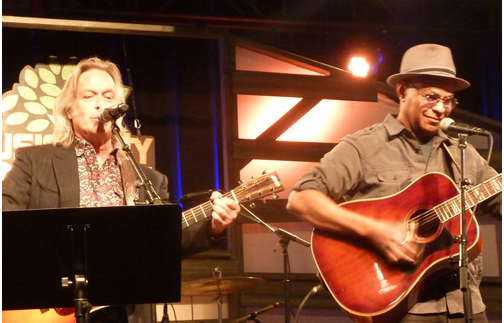 If you missed it, you can click the photo of Guy & show host, Jim Lauderdale and listen to it now. M.C. Records shared a post.